The Bubbles and Rainbows in Preschool dove beneath the water this week when TPS alum (and former preschooler!) Lyla Forman visited to share her experience as a student at the Island School in Cape Eleuthera, Bahamas. Lyla is currently a high school junior at Friends’ Central, but she spent her fall semester away at the Island School, where she was immersed in an extraordinary experiential learning environment. Alumna Lyla Forman inspired our preschoolers with her tales from the Island School. Lyla treated us to a wonderful primer on scuba diving — sharing breathtaking photos and images of life under the sea. We learned about diving equipment, including fins, oxygen tanks, dive masks, wet suits, and “regulators,” and we learned how important preparation and teamwork is when embarking on a scuba adventure. Lyla taught us about “dive slates,” which are used underwater to create observational drawings with waterproof markers. In addition to sharing her diving experiences, Lyla talked about some boating fundamentals. We learned a new expression — “anchor-watching.” (The anchor watcher is the person on board who stays awake at night to ensure the boat is anchored.) While studying at the Island School, Lyla pursued her interest in sharks, and the preschoolers were fascinated to hear about one of Lyla’s favorite sea creatures! 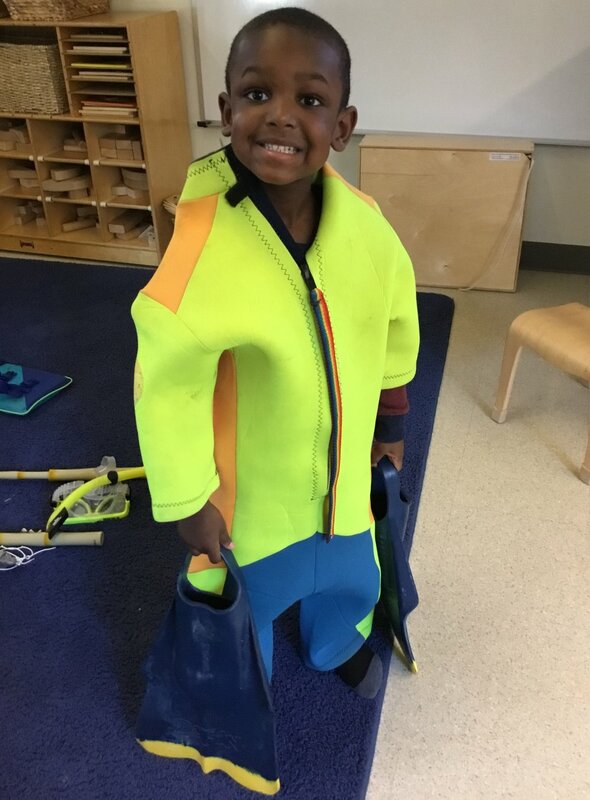 Lyla’s presentation inspired our preschoolers to create our own (pretend) diving equipment with materials available in our classroom “recycleteria.” “What would it be like to scuba dive?” we wondered. We took a first step in a vicarious experience as we took turns trying on the swim fins Lyla left in our classroom — many of us with straws and other breathing apparatus taped to our faces! Meanwhile our loft-turned-boat features some new additions — a colorful hammock for relaxing in and a display of nautical flags created by your children in the art studio with Rick. During yesterday’s project time, we spent the morning exploring our ever-changing space. The teachers led the children in various small group activities, where their nautical knowledge was supported in dramatic play scenarios. Madeline led one group on a “fishing expedition,” where the children used magnetic poles to “ice-fish” for alphabet letters in the water table. Mary Beth created a magical blue background on our projection screen, where we saw fish and coral aplenty. Donning wet suits, masks, and diving fins, the children crawled around the classroom, “exploring” life under the sea. (They used clipboards and pencils to make observational drawings on dive slates as well, just as Lyla had taught us!) Lisa’s group created a list of provisions for their journey, participated in a boat “clean-up” and then climbed aboard with life vests and fishing gear in hand. After charting a course and steering through a storm, one sailor agreed to be the “anchor watch.” And this morning we created “fruit boats” for snack and tested our own “wind power” with straws and boats in the water table. Our ships are still sailing! Newer PostIt's March . . . Mini-Courses!